With ProCall Enterprise, expand your groupware solution of Outlook with modern Unified Communications & Collaboration functions. These support your team in daily work steps and make them more agile. Expand your groupware solution from email and calendar functions with modern CTI comfort features and the latest Unified Communications & Collaboration functions. An intelligent presence management and simple calendar integration form the basis for successful collaboration in the company. See immediately in your ProCall Enterprise client which of your colleagues is in a meeting or has an appointment and when he can be reached again. You can benefit from this information in a team internally as well as external customers and suppliers. Discover the variety of options that become possible with the integration in ProCall Enterprise. 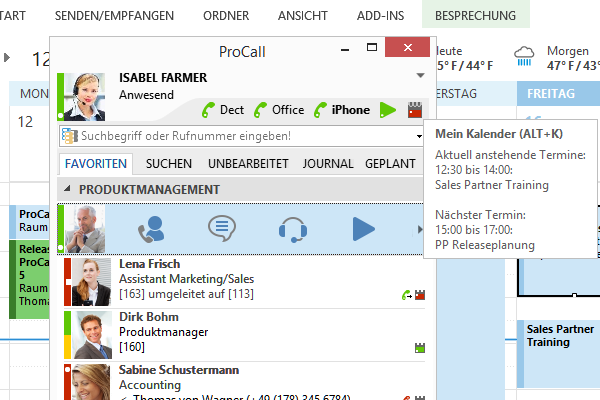 The contacts from Outlook are connected to ProCall and the contact data is thus displayed in the ProCall call window for incoming/outgoing calls together with the contact image. With ProCall it is possible to connect the local contacts as well as the public contacts. Transfer contact data for an incoming call directly to the Outlook contact, e.g. from a telephone directory or a CRM/ERP system. During a call, the original Outlook contact can be opened (automatically or manually) if required, e.g. to be able to edit it further or to add notes. ProCall integrates the Outlook calendar and uses this as a source for the presence display, amongst other things. In this way, you can see immediately if your colleague is currently in a meeting, on holiday or available. Public and, as an option, private dates are also integrated here. An appointment can switch call forwarding in ProCall depending on the subject. For example, an "in meeting" appointment can automatically switch call forwarding in the CallCenter. Call forwarding is automatically removed when the date (appointment) passes. Select the contacts or emails directly with a click of the mouse, by hotkey dialing or via the ProCall Outlook AddIn from Outlook. Conveniently plan your pending calls via Outlook tasks. The ProCall reminder window prevents you from forgetting any more calls and offers you dynamic control functions. Your telephone calls are archived in the Outlook journal. Telephone notes that you have written via the ProCall call window are saved in the Outlook journal entry. Using the Outlook business card, you can start communicating directly from each contact, date or mail with people from your company or, via Federation, with partner companies. In this way, you can decide by means of the presence provided by ProCall which communication channel is most suitable. The means of communication not only includes text/audio and video chat, but also telephone calls via the system telephone and a smartphone/classic cell phone using Bluetooth. 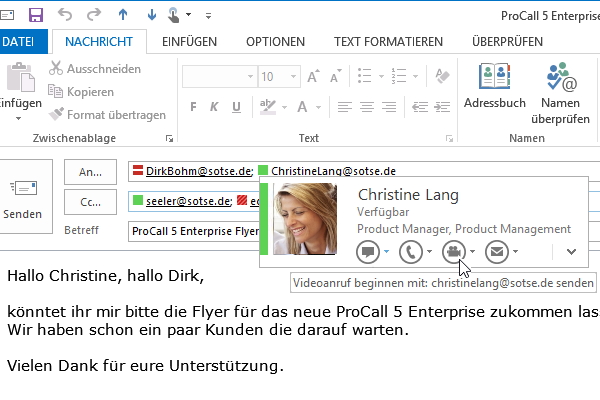 Um Funktionen von estos ProCall aus Outlook heraus verwenden zu können, wird auf Wunsch ein Add-in installiert, welches eine Toolbar für den schnellen Zugriff in die Outlook Oberfläche integriert. The online status in Outlook is pre-filled with the ProCall presence details so that you always see which of your colleagues are available and which are not. In this way you can maintain your communication faster and work in individual teams can be distributed more easily. Make use of integration successfully! The Outlook integration in ProCall Enterprise allows you to use numerous helpful functions relating to contact management, telephony and also modern Unified Communications functions. This provides you and your employees with versatile options such as call planning, task assignment and more, that significantly simplify and partially automate daily work steps. You not only benefit from an improved information situation but can also focus more on customer service again. Do you want to get more out of Outlook & Exchange? Then we are the right contact partner. Contact us and we will be glad to advise you on all the options, your favorites and which requirements must be met for your integration. Get information from our experts about application scenarios and more.